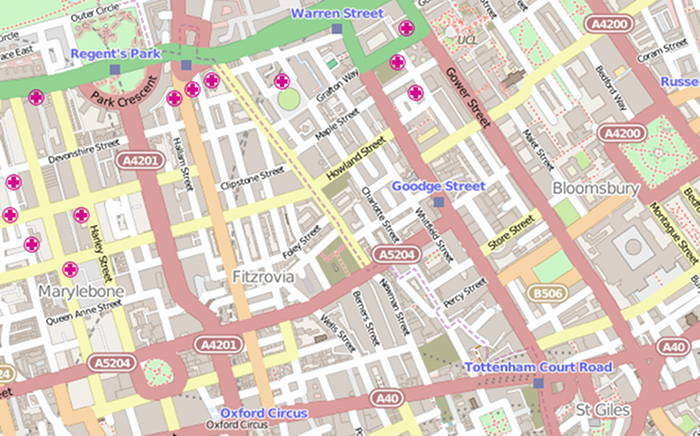 There were 4 planning applications validated in the Westminster part of Fitzrovia between 15 and 21 June 2015. To view the list of planning and licensing applications see below. Homeslice, Basement And Ground Floor, 52 Wells Street, London W1T 3PR. Comments until 8 July 2015 – variation of licence 15/04618/LIPV. Variation of Condition 11 of planning permission dated 03 March 2015 (RN: 14/10697) for Excavation of a new basement level; creation of balconies on the front elevation at first, second and third floor levels; alterations to facades including new and replacement windows and new garage doors; erection of a mansard roof extension to No. 7 Bourlet Close and an extension at rear basement and ground floor levels and use of the buildings as six residential units (Class C3); Namely, removal of reference to achieving the Code for Sustainable Homes level 4. Use of the public highway for the placing of 22 tables, 48 chairs, 8 planters and 15 barriers in three areas on Market Place measuring 7.2m x 1.75m, 25m x 1.6 and 4m x 2m in connection with the ground floor use. Installation of a galvanized steel handrail to the front entry steps. Amendments to planning permission dated 09 December 2014 (RN: 14/08579) for erection of rear extensions at first to fourth floor levels; a single storey roof extension; creation of green roof areas at second, fifth and main roof levels; and use of the first to new sixth floor as 5 residential flats. Creation of terraces at second to sixth floors and external alterations to the facades of the building. namely, alterations to the first floor layout, installation of a new window at first floor level and the use of metal railings to replace the use of glazed barriers at roof top and balcony levels.